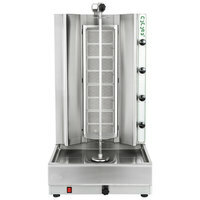 Bring authentic Greek food to your restaurant business with a gyro machine! These delicious sandwiches, consisting of shaved meat, vegetables, and Tzatziki sauce on a flat pita, are sure to bring a taste of Greece to any menu. 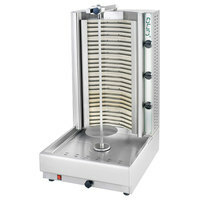 With a quality built gyro cooker from trusted brands, you can rest assured you’re getting a reliable gyro spit you’ll be able to use for years to come! 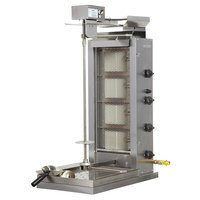 Our vertical broiler machines feature a spit or steel rod to securely hold meat in place for easy cooking and serving. Choose a countertop shawarma machine to make delicious shawarmas, tacos el pastor, shish kebab, or doner kebabs with chicken, beef, or lamb. 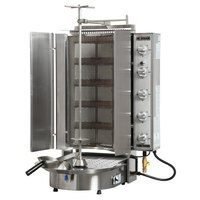 We have broilers that come in both gas and electric configurations for your convenience, and can hold anywhere from small amounts to hundreds of pounds of meat! 27 12 - 35 Lb. 9 45 - 70 Lb. 17 85 - 130 Lb. 13 140 - 200 Lb. 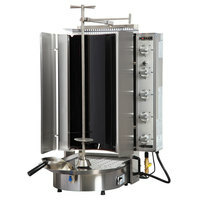 The Optimal Automatics 3PGM Autodoner liquid propane vertical broiler is a strong addition to any restaurant that serves lamb, goat, chicken, turkey, or beef! 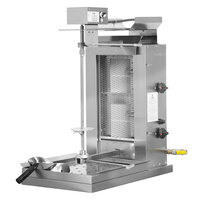 This vertical broiler uses one 20,000 BTU burner to evenly warm up to 35 lb. 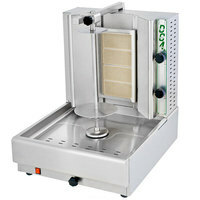 of meat, keeping the inside juicy and tender while the outside gently crisps. 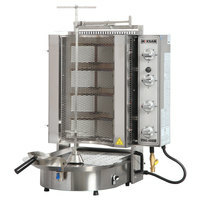 The Inoksan PDG 102MN liquid propane doner kebab machine / vertical broiler is an excellent way to make delicious strips of meat for your gyros or doner kebabs. 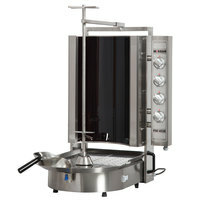 It has two reliable, independently operated burners with low / high heat settings of 572 / 932 degrees Fahrenheit. 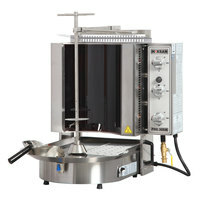 The broiler has a large capacity range, as you can cook between 20-100 lb. 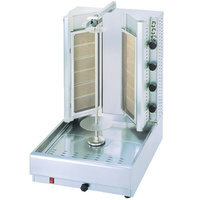 of meat with little difficulty. 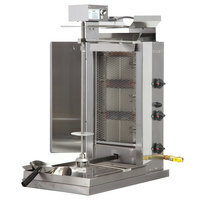 It even features a selector switch that allows you to choose which direction the spit should rotate for either right-handed or left-handed cutting. 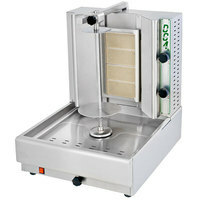 The design of the machine and the 22 1/2" tall spit ensure an inclined cut of the meat. 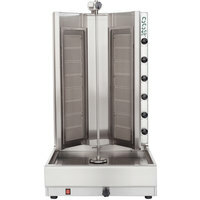 The Optimal Automatics 3PGM Autodoner natural gas vertical broiler is a strong addition to any restaurant that serves lamb, goat, chicken, turkey, or beef! 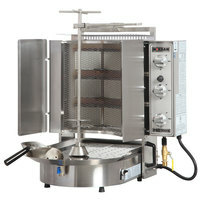 This vertical broiler uses one 20,000 BTU burner to evenly warm up to 35 lb. of meat, keeping the inside juicy and tender while the outside gently crisps. 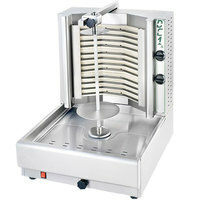 The Inoksan PDG 102MN natural gas doner kebab machine / vertical broiler is an excellent way to make delicious strips of meat for your gyros or doner kebabs. 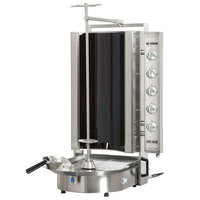 It has two reliable, independently operated burners with low / high heat settings of 572 / 932 degrees Fahrenheit. 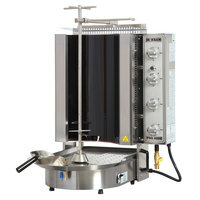 The broiler has a large capacity range, as you can cook between 20-100 lb. of meat with little difficulty. 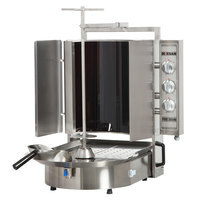 It even features a selector switch that allows you to choose which direction the spit should rotate for either right-handed or left-handed cutting. The design of the machine and the 22 1/2" tall spit ensure an inclined cut of the meat.